Through our partnering arrangement with GSM Roofing and RoofConnect, GSM Industrial can supply and install your SafePro Roof hatches. 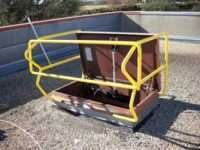 This auto opening, fully safety railed, solar powered roof hatch is the latest in ease of use and OSHA compliance. You can see the benefits on this video.